The events of this raid have been analyzed in the recent article, “The Christmas Eve massacre, Iona, AD 986” by Thomas Owen Clancy. He suggests that this attack was not as “simple as Viking vandalism”, but was tied into the political and ecclesiastical rivalries of the region. Iona is regarded as one the most important religious centres of the British Isles during the Early Middle Ages. 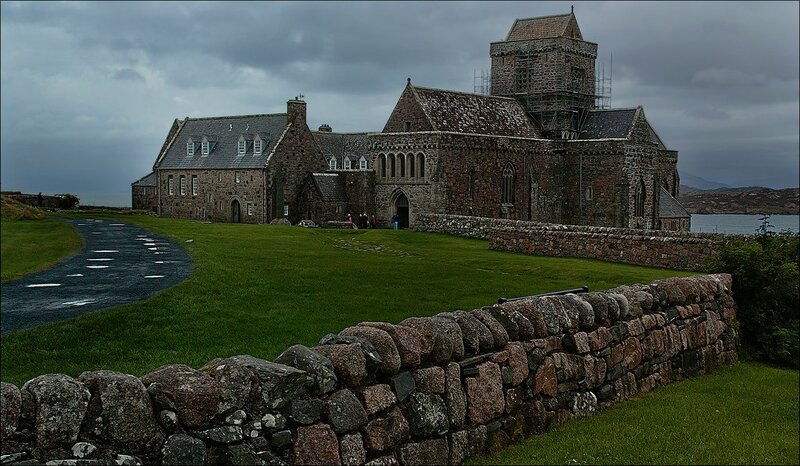 Located on a small island off the western coast of Scotland, the monastery was founded in 563 by Saint Columba. It would become renowned for its learning and its missionary work help convert the Picts and parts of Anglo-Saxon England to Christianity. However, the arrival of the Vikings at the eighth-century would mark a change in the fortunes for the monks at Iona. The monastery was attacked in 795, 802, 806 and 807 – following the fourth raid the remaining men decided to abandon the site and live at the monastery at Kells in Ireland. By the second half of the tenth-century the monks has returned to Iona, and the monastery, according to Clancy, was again serving as the head of a monastic federation that included Kells. Crucial to this argument is an understanding of the way in which, during the tenth century, ecclesiastical houses seem to have become part of a factional war between alliances, a war in which Kells and other Columban houses were on opposite sides. A key player in this war was Amlaib Cuaran, Scandinavian king of Dublin and the Isles, who can be seen patronising various Columban houses, including Iona, where he died as a pilgrim in 980. He was also notoriously the sacker of Kells in alliance with rulers of the midlands kingdom of Brega earlier in 970. The death of Amlaib would be followed by the rise of another figure in the Irish Sea region – Gothfrith mac Arailt, who would make an alliance with the ‘Danes’ based in Dublin in an attempt to take control of the region. Clancy suggests that the attack on Iona was part of Gothfrith’s plan to weaken the power of Amlaib’s sons. This would follow a trend that emerged in the tenth century where political rivals in Ireland would attack the monastic centres and churches that supported their opponents. These attacks also coincided with “a bitter and bloody turf-war within the” monastic communities of the Irish Sea region, where places like Iona and Kells were arguing with each other over which house was the leader. The attack on the Iona, which, according to other Irish sources, also included the killing of “Mael Ciarain ua Maigne, the successor of Columba” would leave the monastery permanently weakened, and leave the monastery at Kells as the undisputed leader by the 11th century. Clancy also notes another episode recorded in the annals – in 989, following the death of Gothfrith mac Arailt, when Mael Sechnaill mac Domnaill led a siege against the Vikings at Dublin. The defenders held out for over twenty days, even resorting to drinking sea water, before they were forced to submit and recognize Domnaill as king. They also were forced to give to him “an ounce of gold for every garden to be paid each Christmas Eve, for ever’. Clancy writes, “The specificity of the payment date, and its correlation with the date of the massacre on Iona a mere three years before, suggests that Mael Sechnaill was engaging here in some clever politics, and aligning himself as the avenger and patron of” the monks of Iona and the larger monastic community of the Irish Sea region. The article, “The Christmas Eve massacre, Iona, AD 986” by Thomas Owen Clancy, appears in The Innes Review, Vol. 64:1 (2013). Thomas Clancy is a Professor of Celtic at the University of Glasgow and has written extensively about Iona and early medieval Scotland. Click here to view his webpage at the University of Glasgow.